You may have noticed on my sidebar the cute little button for the Layer Cake Quilt Along. I mentioned it in a post a few weeks ago as another way for me to continue to use up stuff in my sewing room. So I finished my first block and am very excited to post it on the Flickr group for this project. It's called Alabama Spinner by Gene Black and I love it! The quilt-along calls for a layer cake of fabric, but I am using fat quarters from my stash. 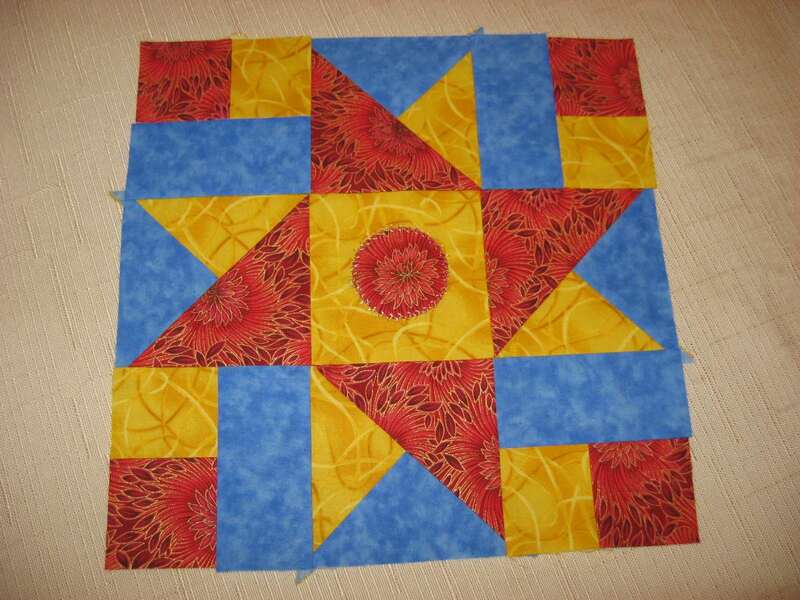 Here's a close-up of the center square on this fun block. I discovered a stitch (I was going to say new stitch, but nothing on my machine is new!) on my sewing machine for machine applique instead of using the old stand-by zig zag stitch. And because the red fabric has gold in it, I used more of that sparkly gold sewing thread to dress it up a little. I think the next block will be presented this week sometime and now that I have started on the project, I am excited to continue it. The crochet-along I'm working on is almost finished so this will be a fun thing to look forward to every few weeks. Like I need more stuff to do at this time of year! How about you? It looks great! Your post reminded me to go take a photo and post mine as well. I'm fairly new to this, and I wasn't yet brave enough to add the circle in the middle...I may yet this week give it a shot though! Lovely quilt block - the colors make me smile - so cheery. Golly you will soon have a new afghan and a new quilt - what fun!! That is a great block. 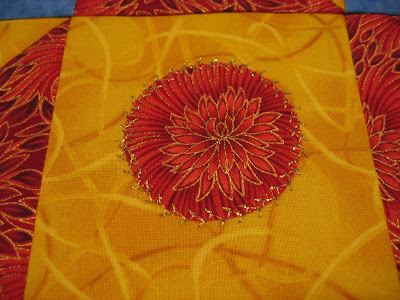 I like the gold thread you used-really makes that center sparkle! Beautiful colors in your block. I love the applique stitching you used.